Life skills come in all shapes and sizes and we are proud to provide our members with some of the tools they need for the future through the organisation of a wide range of leisure activities. Making friends, working together, boosting confidence, educating and stimulating are at the very heart of everything we do here at Wallsend Boys Club. 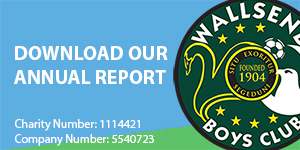 Wallsend Boys Club is about more than just football ….. it provides a wide range of activities, free of charge for both boys & girls of all ages. Why not come along and and try something new! We are very proud of our current facilities at Kirkley Park which are evolving all the time and provide a home four our 20+ teams to play, they consist of 7 grass playing pitches, changing facilities and match day cafe. We are currently in the planning stages to develop the site further adding an outdoor 3G and an indoor sports hall to the site. If your child would like to join us on our amazing adventures or you would like to volunteer with our youth section and help out in anyway, we’d love to hear from you, we are always looking for people who can give us their time and expertise from helping out with youth sessions and driving on trips, to PR and marketing and social media…get in touch we would lo to hear from you! A charity guiding young people to achieve their potential through positive activities and opportunities.